I was going to write today about decorating my Christmas cake when I realised I had to let the icing dry before decorating it and I’d left it too late. So that’s coming later in the week. 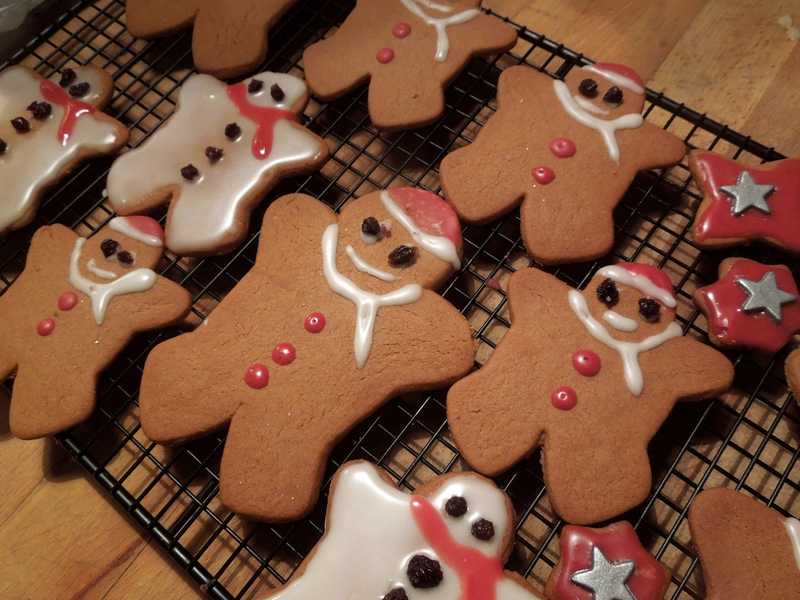 In the meantime, here’s a bonus post about Christmas gingerbread. Children love making and decorating gingerbread men. I’d like to say kids made these but I’m afraid the icing was by my own inexpert hand. I tried two versions. The first I felt was insufficiently gingery and a bit too hard, although it would have made good tree decorations. The second batch was better so that’s the one I’m sharing with you today. You’ll need a gingerbread man cutter unless you have a good eye and a steady hand, although of course you can cut any shapes you like. 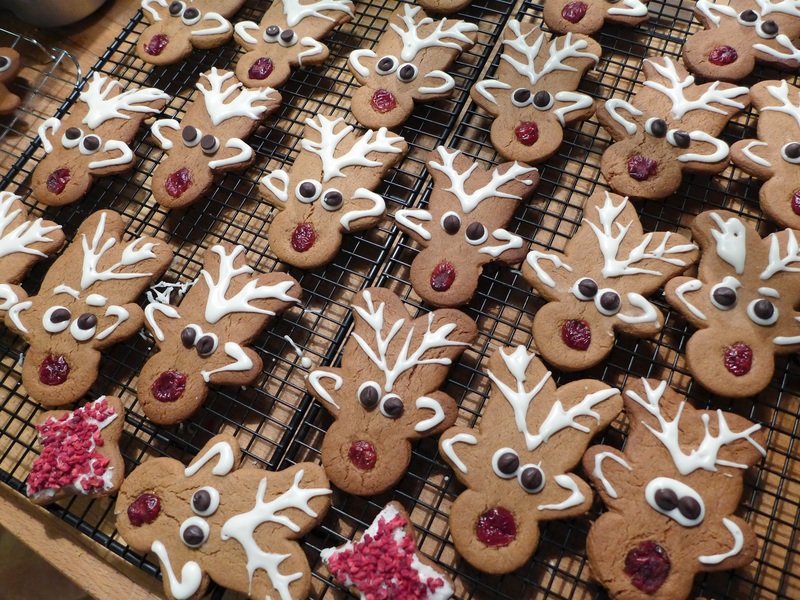 If you turn a gingerbread man upside down, you can turn him into a reindeer …. Pre-heat the oven to 375F/190C,Gas Mark 5. Grease three baking trays. Sift the flour, bicarb and spices into a bowl. Cut the butter into small pieces and rub it into the flour mixture until it looks like fine breadcrumbs, then stir through the sugar. Beat the egg with the golden syrup and add to the bowl. Mix to form a smooth dough then get your hands in there and knead it lightly. Lightly flour your work surface and roll out half of the dough to about 5mm thick. 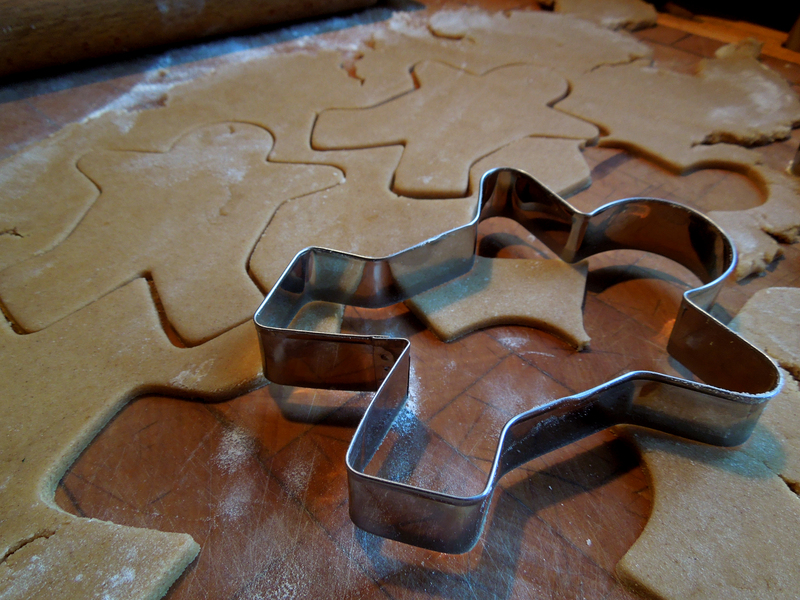 Cut out gingerbread men, then repeat with the remaining dough, re-rolling where necessary. 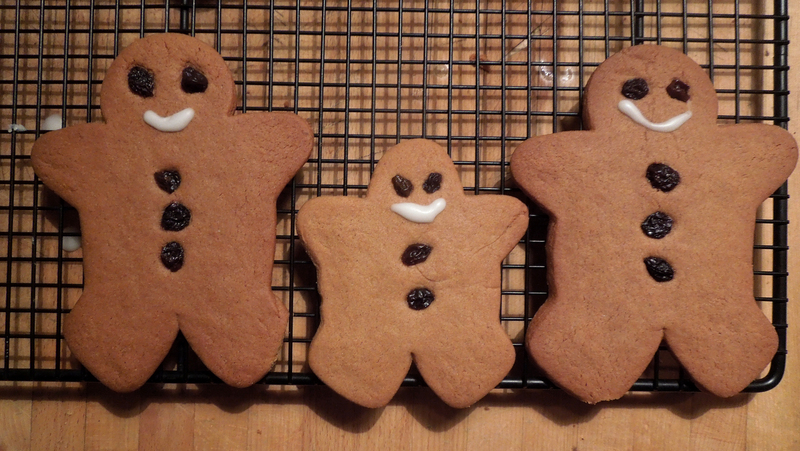 For traditional gingerbread men, use currants for eyes and buttons now. If you’re icing the biscuits, do it when they’ve cooled. Bake for 10-12 minutes until they’ve darkened slightly in colour, then remove gently with a spatula (they’ll still be a bit bendy at this point) and leave to harden and cool on a wire rack. If you’d like to ice them, mix about 125g of icing sugar with one tablespoon or water or lemon juice, beating with a wooden spoon until it’s thick and glossy. Split it between two or three bowls if you’d like to colour it. I find gel food colourings work the best. Using a small piping nozzle or spatula, depending on the effect you want, ice the gingerbread men. A dot of icing will stick on any decorations you want to use for eyes and buttons if you didn’t use the currants at the pre-bake stage. This entry was posted in Desserts, cakes and biscuits, Vegetarian and tagged Christmas biscuits, Christmas cookies, Christmas gingerbread, gingerbread men by Linda Duffin. Bookmark the permalink. A good eye and a steady hand might be asking a bit much of me. I love the first batch. 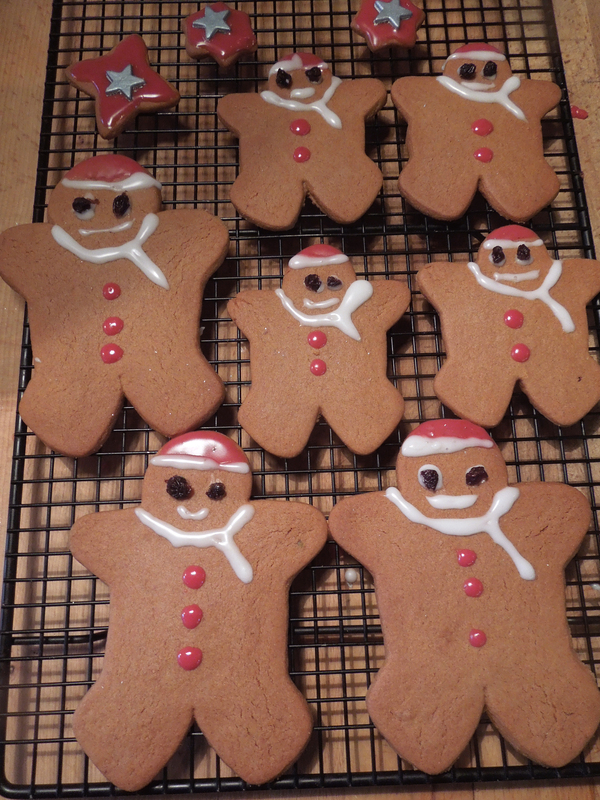 One if them is wearing a Gingerbreadmankini! Yes, made it in case Borat dropped by for a quick coffee. 🙂 Did you see the final pic? The mankini was so popular I had to make more for certain girlfriends who shall be nameless. You make me shudder Linda. You could have even put a currant covered in icing for enhanced budgie smuggling effect….